Apparently milky skin, a waif-like silhouette and golden locks run in the Moss family. Introducing Lottie, the 13-year-old half sister of the most famous model of our time, Kate Moss. She's just posed for her first test shots and by the looks of them, is on the path to a very promising career. But is she too cookie-cutter beautiful? In these images she looks like a squeaky clean, all-American sweetheart, and these days it just isn't enough to be pretty. If she can find that unique energy and charm that made her sister a cultural icon she just might have a chance in the competitive world of modeling. 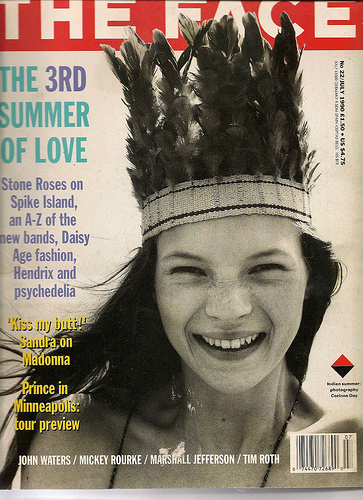 Kate Moss at 15 in The Face Magazine 1990. Can't believe this girl is 13 thats crazy, maybe a little too all american looking but should be interesting to see what happens. She's 13?? She looks like Nicole Richie in the first photo, don't you think?